Wow! I can’t believe we’re at 100 posts in our weekly round-up series, where has the time gone? To celebrate I’ve put together a list of blogs that you need to checkout in 2017. 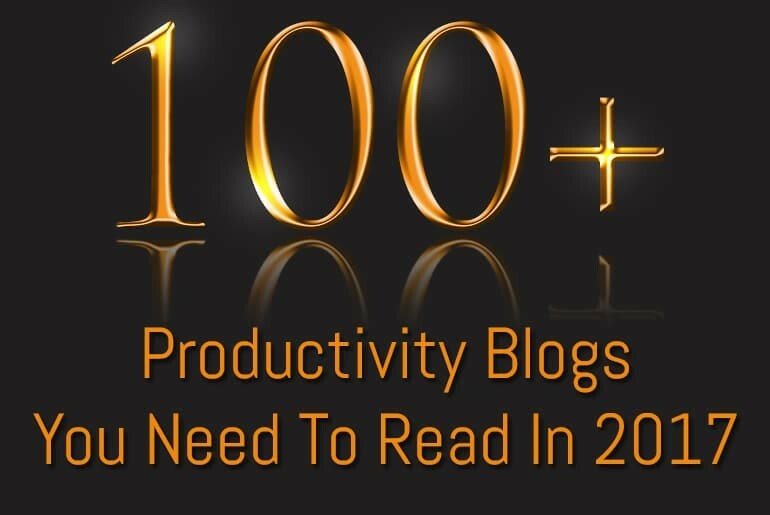 It started out at 100 but that was a bit limiting so we’re now on over 120 productivity blogs in this list! If you think I have missed one out and would like me to add it, please Contact Me so we can share it with everyone. The list below covers a wide range of topics from blogs about work-life balance, minimalist workplaces and making your office space more productive to great authors who write about self-improvement, motivation and positivity. Because it was too hard to pick an order to put these blogs in – they’re all fantastic – I’ve ordered the list alphabetically to be fair. The one caveat for inclusion was that ttihese blogs had to have posted a new article within the past 3 – 6 months. If you want to add these great blogs to your RSS Reader you can download a zipped OPML list of the feeds at the end of the post. I hope you like this Round-Up and don’t forget to subscribe to by blog using the form below to stay updated with productivity techniques, self-improvement and motivation tips, free downloads and of course my weekly round-ups of productivity news. 99U covers a variety of topics that centre around working for yourself or in a small business. Learn how to manage your time, budgets, worklife balance and more from this site. Anubhav Srivastava isn’t just a movie producer, he’s also into productivity too. His blog’s productivity category is full of some great topics and whilst it may no be updated too often the qualiy is great. With a more business related slat, Become More Effective covers leadership, customer management and engagement and more. Want to read a book but never seem to have the time? Book Video Club has your back! Watch books on video in a concise format so you get the main messages without having to read through everything. DIY Planner is planner heaven! You can download a massive array of planner page designs in a variety sizes in order to make you own custom planner – now you have no excuse not to be productive! You may think of Evernote as a simple collation and note taking toolbut it can do so much more than that. Find out how to become super roductive with this great tool. Finer minds is all about self improvement through honing your mental outlook – towards yourself and others. If you’re looking into getting in to planning but don’t know where to start, or are already a planner and are looking for some inspiration then the Giftee Etcetera blog has you covered! Grace Marshall covers Productivity with an eye on your wellbeing. From why saying “No” i important to giving your soul a rest. Happy Melly is all about supporting workplace happiness – after all, a happy workforce is a productive one! The team from Collaboratio and Worflow App “Invision” have a fantastic productivity section that covers everything from willpower and work-ife balance to visual planning. The cateogry is being added to reguarly to its worth checking in often. Abby has some great ideas around home organising tricks helping you make your “offline life” more streamlined, saving you time in the process. Theo J. Ellis came to my attention when he was cited in another blog, I checked him out an found his strory inspirational. Plus, being a fellow Brit it’s nice to know I’m not the only person on this island writing about productvity! Life Learning Today: Life Improvement Tips You Can Use Today! Lifehack is one of the top Productivity blogs but seems to rarely make any productivity blog lists presumably because it’s such a big name. They features little old me in a productivity blog list a few years ago so I thought I’d return the favour! Lone Mind covers a bit of everything, from budgetting tips to destressing to, well, sorting out your bikini area – that’s self improvement though isn’t it? Mike and Angel have a lovely spiritual way of tackling productivity – you may not see yourself as being spiritual but the posts in this blog will speak to you. Mark Manson covers so many subjects I wouldn’t know where to start. Whilst there are great deal of personal develoment and “Soul Searching” posts, there are also those that focus on self-improvement and personal wellbeing that are really worth a look. Michael Sliwinski: Productivity with passion to achieve success! Miriam covers a plethora of home management and organising subjects from managing your holiday timetables to how to develop a sustainable organising habit. Nozbe may have a weird name but it’s certainly up there in terms of To-Do list planning apps and their blog is full of great advice too. Anything journal, planner, paper or pen related is fair game in Megan’s website. Be warned that you’ll need to be kept away from Amazon as you’ll be inspired both artistically and organisationally! Paul Minors reads a lot of self-help and self-improvement books so taht you can get on with living your life and just pick and choose what you need to read am focus on what is important to you. Paul also has a fantastic produtivity podcast that features a wide range of knowledge and advice so it’s well worth subscribing too. John writes aboyut a variety of subjects on personal develoment and success in your life and business. There are insightful posts, helpful downloads and more. The self-styled “Productivityist” Mike Vardy cover everytthing from getting over that Monday Morning Feeling to how to cope when you’re tired. If you find yourself interested in a pletherer of subjects you could be what’s termed as a “Multipotentialite”. If you think you fit that bill Emilie has you covered! You may know Remember The Milk as the List Making and Productivity tool, but did you know they have a pretty informative blog too. If that’s not enough they have a pretty funky toy money for their post photos which is worth checking out on its own! The title of this website says it all! Whether it be improving your self confidence to improving your emotional intelligence this blog can help. Shawn Lim may be on the young side but he has a lot of relevant tips for anyone interesting in Goal setting, being productive and being positive plus much more. Ciara writes in a fun and friendly manner about how bad to-do lists can be, how to make your business more productive and even how Star Wars can teach us lessons! Download the zipped OPML file and you can import it into the Feed Reader of your choosing. Ask and you shall receive Lionel! There’s now a zipped OPML file available to download at the end of the post! Hello Katy, thanks so much for putting together this productivity roundup. It is quite an impressive list. I truly appreciate you including my site, TheOrderExpert.com. Best wishes to you for a productive 2017! Thank you Katy for including me in your top 100 productivity list. I’m grateful to you. Wow Katy – this is an awesome list. Some of them are new to me, and the content on these blogs are fantastic. Thanks Nissar – Glad you liked it. I’ve bookmarked your site to check through your articles with a view to including something in a future weekly round-up but if you have anything specific you’d like me to look at please feel free to contact me via the FlippingHeck.com contact page. Wow, that’s an impressive round-up. Would you be so kind to add https://habitgrowth.com to this list too? I write about productivity and time management tips for entrepreneurs.